Kaplan's faculty consists of seasoned real estate professionals who not only teach, but in most cases are also practicing real estate brokers, attorneys, appraisers, mortgage experts, or CPAs. They bring relevant and timely real-world experience into the classrooms, and are even asked to act as advisers on pending real estate legislation. Our faculty members have persevered through the ups and downs of the market and have tremendous experience navigating in down economies and coming out on top. They are committed to the industry, and their enthusiasm for future of real estate is unparalleled. Kaplan's seasoned faculty members average nine years of real estate teaching experience. Real estate regulators frequently consult with Kaplan faculty regarding content on state and national real estate exams, and industry publications. Our faculty members are routinely asked to be host presenters at Real Estate Educator Association conferences. 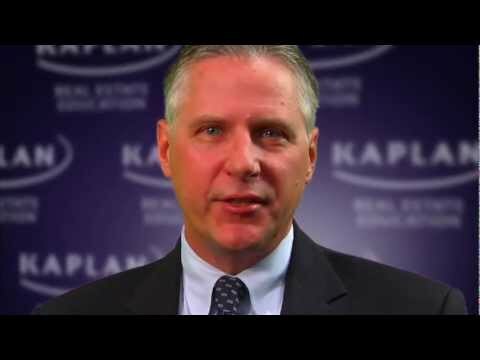 Many Kaplan faculty members have two careers: They are instructors as well as authors and consulting editors of some of the most popular real estate textbooks in the U.S.
As keynote speakers, our faculty members often present to a full house—one Kaplan instructor in particular recently presented to an audience of over 9,000 people. Our faculty members have helped lay the foundation for thousands of successful careers. One member boasts a lifetime career attendance record of over 120,000 attendees. Finally, because our faculty members are real estate professionals themselves, we understand that busy professionals have busy schedules. We personalize our programs to meet your needs, providing you with the efficiency you want without sacrificing the effectiveness you need. As a Kaplan student, you’ll benefit from the energy and expertise of our “rock star” lead faculty. Together, they collaborate with our team of over 150 instructors to provide personalized and innovative training to help you meet your educational and career goals. Our instructors will give you the personal attention you need to help transform your tomorrow. Art views real estate as the “great equalizer”, providing equal opportunity for success regardless of a person’s background. Art is no stranger to that success. He’s been active in the real estate and mortgage brokerage industry since 1995. Since 2002, he’s been channeling his passion by helping Kaplan students enter into fulfilling real estate careers. Jean wants students to succeed inside and outside of the classroom. She’s excited to teach what she learned in her twenty years as a practicing real estate professional. Since 2007 Jean has been passing on this wealth of knowledge to Kaplan students. Ask Jean what the most exciting part of teaching is and she’ll tell you that it’s the interaction with new agents and helping them to on their road to success. Learning goes both ways for JoAnn. She expects to learn from her students while she’s teaching and feels that learning is a lifelong process. She loves interacting with different perspectives in her classroom and has over 30 years of combined teaching experience in secondary education and as a Certified Distance Education Instructor (CDEI) and USPAP certified instructor. She has also authored many of our continuing education courses. Rolfe’s passion for real estate education stems from his desire to be involved in the process of discovery with his students. For over twenty years he has been helping students like you succeed by sharing his background in real estate investment development and sales. He holds a degree in Construction Management from the University of Wisconsin.